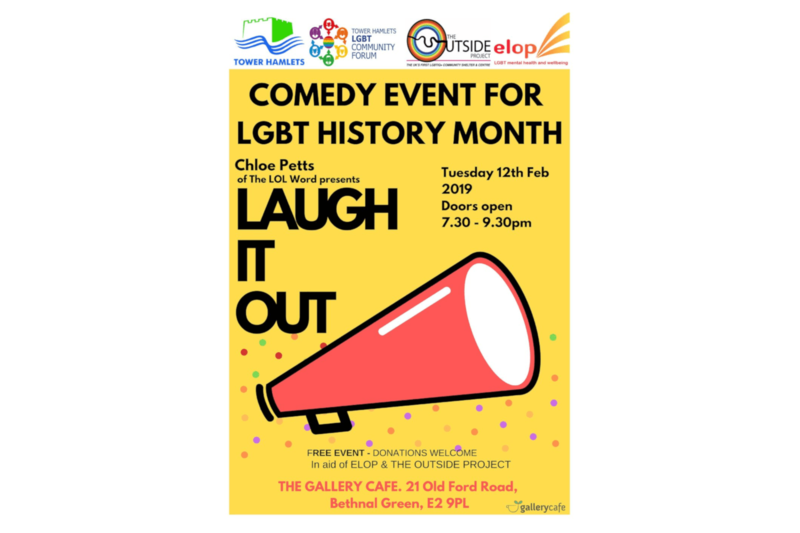 To celebrate LGBT History Month, Chloe Petts of The LOL Word is presenting ‘Laugh it Out’ at the Gallery Cafe on Tuesday 12 February. ‘Laugh it Out’ is a fun packed comedy evening with LGBT related humour. Chloe Petts is a stand-up comedian, Funny Women 2018 Runner up, and LSQ New Comedian of the Year 2017 finalist. The event is free but donations are encouraged as the event is in aid of ELOP and The Outside Project. ELOP, the organiser of ‘Laugh it Out’, is an innovative LGBT mental health charity based in East London. Established in 1995, ELOP promotes mental health, wellbeing, empowerment, and the equality of LGBT communities and provides advice, counselling and support services along with their community events. The Outside Project are LGBTIQ+ friends and activists who work in the Homeless sector, and have launched the UK’s first LGBTIQ+ Crisis/Homeless Shelter & Community Centre.